A woman fills a container with water from a truck in Caracas, Venezuela, Wednesday, March 27, 2019. 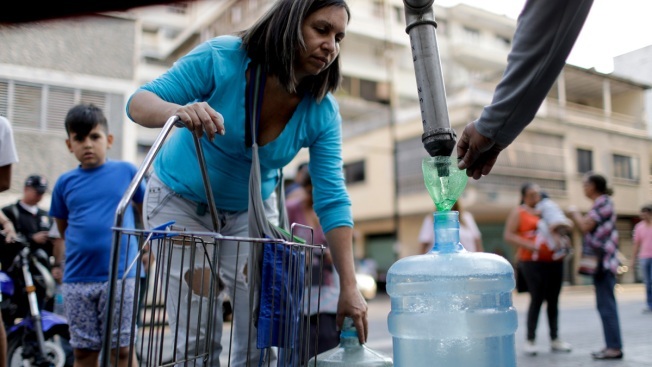 After days of intermittent electricity supply in Venezuela, which affects the water supply, the people in the capital city have started to collect water from waterfalls and wells and carry it to their homes. More power outages hit Venezuela on Wednesday after the nation's worst blackouts earlier this month, knocking out water pumps and forcing some Caracas residents to spend hours searching for bottled water in the few shops that were open or to fill up containers at springs in the city's hills. Frustrated Venezuelans wondered how long they would have to endure the new outages, which started Monday and again shut down schools, offices and factories in a country whose economy has been shrinking for years despite its oil wealth. The power crisis has sharpened a political struggle between President Nicolas Maduro and opposition leader Juan Guaido, who urged supporters to protest as a response to Venezuela's deteriorating infrastructure. "We can't be passive," said Guaido, who announced a protest campaign titled "Operation Liberty" that includes planned demonstrations on Saturday and on April 6. On Wednesday morning, a new disruption to the power grid left 91 percent of the country offline, reversing a "partial recovery" since the start of the latest nationwide blackouts, according to Netblocks, a group that monitors internet censorship. By afternoon, the flow of power remained erratic, returning in some areas only to go off again in a pattern that is now familiar. "It comes and goes. Last night it came back at ten o'clock at night and at five o'clock in the morning it left again. It hasn't come back since," said Luis Jose Vargas, a 48-year-old baker carrying a container of water filled from a brook. "With water," Vargas said, "it's the same." As the outage stretched into evening, people howled with anger in the street and from apartment windows in one neighborhood where the power, which had returned for some hours, went out yet again. Some cursed Maduro. Nancy Villasinda said she spent more than four hours trying in vain to find a shop selling water. The government had said city water pumps were starting to work again, but then another power cut hit, Villasinda said. "I suppose that's why we still don't have water," she said. Maduro's government said schools and state offices and industries were closed Wednesday as workers tried to restore electricity. Few shops in Caracas, the capital, were open and many streets were clear of the usual weekday traffic. 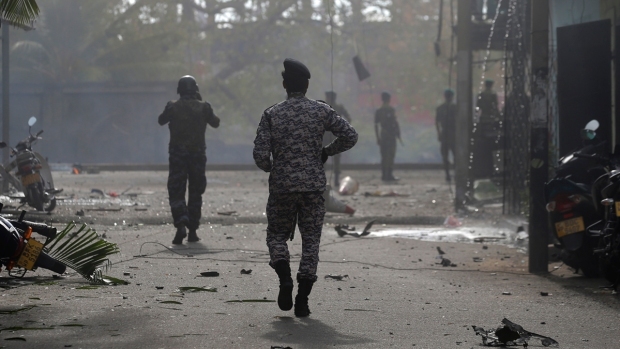 The government ordered schools and businesses to remain closed on Thursday. Maduro said the outage was caused by a sniper attack on the nation's electrical system using a long-range gun in a telephone call broadcast on Venezuela's state television Wednesday. He said the damage was "worse than any Venezuelan could have imagined" but that he hoped to have good news about the restoration of power in the coming hours. He also announced a march Saturday to rival Guaido's, dubbed the "Operation in Defense of Liberty," and urged pro-government groups, some of which are armed, to ensure there is "zero guarimba," a reference to opposition protests. "We're never going to give up," he vowed. After the last blackouts started on March 7, the situation became increasingly desperate for many Venezuelans when water pumps stopped working without power. Looters ransacked hundreds of businesses in the city of Maracaibo. The blackouts eased nearly a week later, but many areas only had intermittent power even after the government said the problem was solved. Maduro, who is backed by Russia, says he is the target of a U.S.-led coup plot and accuses the U.S. and the Venezuelan opposition of sabotaging the country's decrepit power system. U.S. officials and Guaido say the accusation is an attempt to divert attention away from years of government mismanagement. On Wednesday, Guaido's wife was welcomed at the White House as part of a tour to rally international support for the Venezuelan opposition. "We are with Venezuela," President Donald Trump said at the start of a meeting with Rosales and other opposition figures. "What's happening there should not be happening." Associated Press journalist Juan Pablo Arraez contributed from Caracas.